Chion-in in Higashiyama-ku, Kyoto, Japan is the headquarters of the Jodo-shu (Pure Land Sect) founded by Honen (1133-1212), who proclaimed that sentient beings are reborn in Amida Buddha's Western Paradise (Pure Land) by reciting the nembutsu, Amida Buddha's name. The vast compounds of Chion-in include the site where Honen settled to disseminate his teachings and the site where he died. 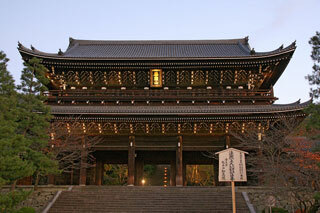 This article uses material from the Wikipedia article "Chion-in Temple", which is released under the Creative Commons Attribution-Share-Alike 3.0 License.